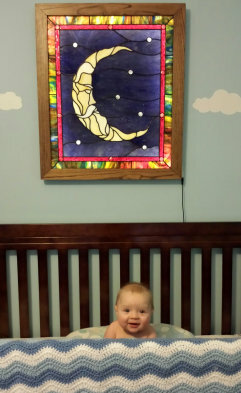 I built this window on a lightbox so that it could be hung anywhere and even be used as a nightlight for the new baby. I used LED strip light technology for brighter & yet dimmable lighting. The 16 foot LED strip in the lightbox has about 300 low voltage LEDs (12 volt) and uses only 24 watts at full brightness. Back in 1982, when my daughter was only 7 years old, I built a stained glass window called "The Old Man" for her. Please click on the image to the right to see the amazing, but true, story of this design. 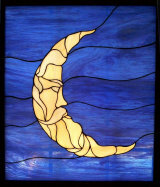 This window hung in my daughter's bedroom window for years.... and later hung in my son's room as he grew up. Since both of my children turned out so well, I like to think "The Old Man" guarded and guided them both as they matured. 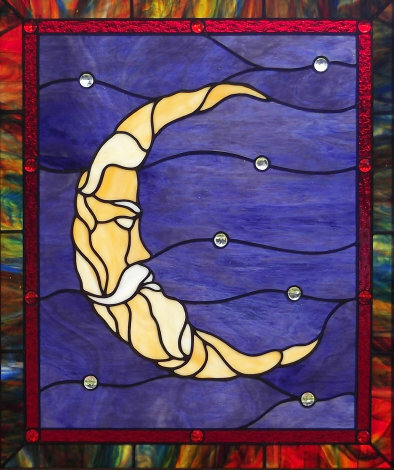 It hangs today in our guest bedroom, so if you come to visit, you too can experience the magic of moonlight through this stained glass window! In August 2013, my daughter brought into this world William Dean Shain. 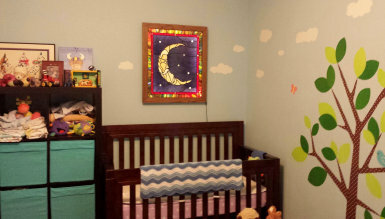 A few months later I built Baby's Moon to watch over my new grandchild as he grows up.